Great Seal of Idaho with the state motto "esto perpetua"
Esto perpetua ( Latin "Be Thou Forever") is the motto of S. Thomas' College, Mount Lavinia, a School in Sri Lanka Established in 1851. The motto appears at the bottom of the crest of the School. S. Thomas’ College was founded by the first Bishop of Colombo, the Rt. Rev. James Chapman, D. D. It was his foremost vision to build a college and cathedral for the new Diocese of Colombo of the Church of Ceylon. Chapman's objective was to train a Christian clergy and to make children good citizens under the discipline and supervision of Christianity. An old boy of Eton College, Bishop Chapman founded the college based on the traditional Etonian model. 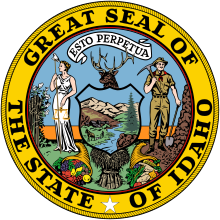 (Also translated as "Let it be perpetual") is the state motto of Idaho. The motto appears on the back of the 2007 Idaho quarter dollar coin. The words are traced back to the Venetian theologian and mathematician Paolo Sarpi (1552–1623), also known as Fra Paolo. The day before his death he had dictated three replies to questions on affairs of state, and his last words were "Esto perpetua" reportedly in reference to his beloved Venice and translated as "Mayest thou endure forever!" These words were also repeated by Henry Grattan upon the achievement of Irish legislative independence in 1782. When the designer of the state seal Emma Edwards Green described the motto on the seal, she translated it as "It is perpetuated" or "It is forever". The phrase was used by Jefferson Davis at the close of his book Rise and Fall of the Confederate Government in a wish that it may be “Written on the arch of the Union.” Of his attempt to break up the Union, he said “I recognise the fact that the war showed it to be impractical”. The four S. Thomas' Schools in Sri Lanka: those in Mount Lavinia, Gurutalawa, Bandarawela and Kolpity, Sri Lanka, translated as "Be Thou Forever"
Chatham Hall School, Chatham, Virginia, translated as "She will live forever"
The motto of Springs Boys' High School, Springs, South Africa. "Esto Perpetua" has been the school's motto since it first opened in 1940. The motto of Springs Girls' High School, Springs, South Africa. "Esto Perpetua" has been the school's motto since it first opened in 1959. The Winyah Indigo Society, Georgetown, S.C., incorporated 1754. ^ Daniel Owen Madden, Esq. (n.d.). The Speeches of the Right Hon. Henry Grattan. Dublin: James Duffy and Sons. p. 70.